2 layer board of 2.87 x 1.37 inches (72.9 x 34.7 mm). Uploaded: April 10th, 2017 21:08. The Open Panzer Sound Card is a work in progress with the goal of bringing inexpensive, high quality, and open source sound functionality to RC models but especially to tanks using the Tank Control Board (TCB). The board is actually made up of two components. 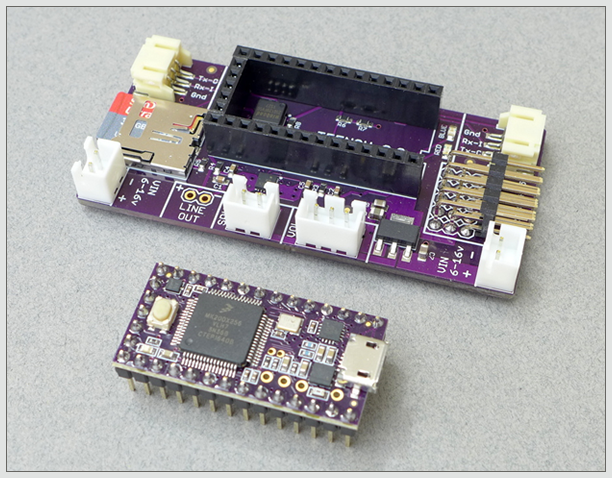 First, an off-the-shelf PJRC Teensy 3.2 is used as the onboard processor. The Teensy is then plugged into a socket on our custom carrier board that adds a Micro SD card slot (max 32 GB), an additional 16 MB of flash memory, an LM48310 2.6 watt audio amplifier, and headers for external connections. A discussion thread on the development of this card can be found on the Open Panzer Forum.